Is Membership in a DNA Circle at AncestryDNA Proof of a Relationship? First of all, “proof” in the genealogical sense is the coalescence of all the information relevant to the determination of an answer to a question, the analysis of that information (generally the determination of its reliability), and the synthesis of the information and analysis into a clear and coherent argument. Membership in a tree is not “proof” in the truest sense of the word–at least from my perspective. Two individuals are related (hence the DNA connection). But just because they share the same (or very similar) ancestors in their tree does not mean that the connection has to be through those “shared” ancestors. The “circle membership” process does not analyze the accuracy of the genealogical connections in their tree. Thanks very much for this explanation, more than I have been able to locate on Ancestry. I will certainly be taking my membership in the two DNA Circles for both the husband and wife of my possible ancestors as only clues for further research. However, being included in them has been an encouragement to me that I may be on the right track, since documentation of the children of one of their daughters, of whom I believe my greatgreatgrandmother to be one, has not been located in nearly 40 years of searching. You are welcome. The circles are a great tool, but like any tool one must use them appropriately. They can be helpful–especially when the DNA indicates there is a connection. 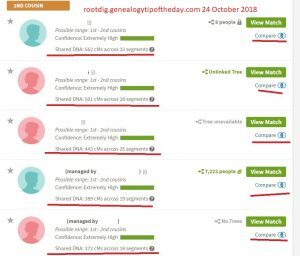 In my opinion, one of the most useful tools offered in AncestryDNA, is the Shared Matches Tab. This feature specifically allows you to determine, which of your parental and grand parental lines this person is a member of, and all others that are a similar shared match. I have been able to determine who many people, who have failed to respond to messages actually are, on spite of their non response, and often even without a tree, due to names they use, and others they also are related to, etc. Shared matches are extremely useful. One problem that some people have is that the want to immediately learn who a certain distant ancestor is on AncestryDNA. It doesn’t work that way. A person needs to work on their closer matches and all their matches to help sift people out.